Barcelona is awash with sunny beaches, breathtaking art, great food, and an electric nightlife make it the Spanish city beloved by many. Touring the Gothic quarter of Barcelona, you’ll encounter the remains of Roman settlements and reminders of the Spanish civil war, rich with history of years long past. Walking through the Old Town and nearby Le Born lets you stumble upon alcoves, alleyways, and plazas that feel like personal discoveries. Narrow, winding alleyways are plentiful in Barcelona and throughout many parts of Europe, adding an intimacy to even big cities that is lacking in most of the US. 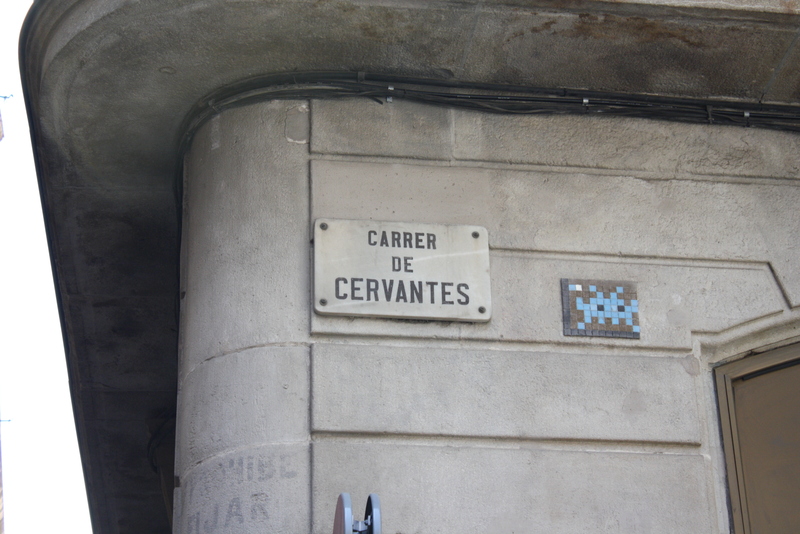 Look sharp and you might even spot some of the famous space invader mosaic street art! There are a number of free walking tours in Barcelona travelers can take advantage of. I started off with Travel Bar’s walking tour of the Gothic quarter, in which you can learn some of Barcelona’s fascinating history and Roman influence, hear about the city’s patron saints, and be shown where Christopher Columbus went to meet with King and Queen Isabella about his voyage to India. Or America. Probably the best screw up ever. 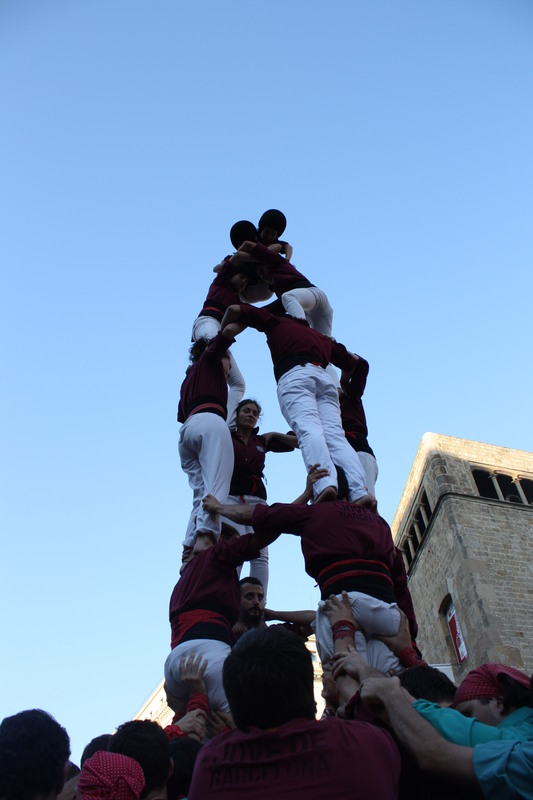 While in Barcelona I also was able to witness the Catalan sport of “castling” in which patriotic Catalans practice the old tradition of stacking themselves on one another’s shoulders to create human towers. The tops of these human towers are adorned with tiny children, usually around age 6, who shimmy up trembling bodies and legs. The young castaller is the only participant who wears a helmet – the rest rely on the pile of supporters at the bottom, who create a human safety net to catch and cushion the fall of castalers. Castling is a very uniquely Catalan tradition, and it’s something you can’t pass up if you have the chance to witness it. The architecture of Antoni Gaudi is nearly synonyms with the city of Barcelona—Gaudi has contributed many well-known gems that have heightened the city’s fame. I learned about Gaudi’s works and life through Running Bean’s Free Gaudi Walking, in which we toured some of the Catalan artist’s best known architectural pieces. Each of Gaudi’s masterpieces throughout the city is impressive in its own right: Casa Batllo, the colorful and lively house which some say illustrates the story of Barcelona’s knight George battling against a dragon, with the monstrous lizard’s curved scales forming the roof, with the bones of the dragon’s victims holding up the bottom levels of the house. Casa Mila is another Gaudi architectural masterpiece, albeit somewhat ominous and gloomy. Park Guell is another incredible Gaudi piece, with many comparing the park’s oddly shaped buildings and candy-colored creatures and mosaics to what you’d expect in an amusement park. In Park Guell you can truly sense Gaudi’s appreciation of nature and love of the organic, with pathways and overhangs integrated into the earth. Ultimately, Barcelona was a beautiful city —full of culture, sunshine, art, and wonder.